Identical Twins D’Shawn & D’Vaughn Knowles: A Rear Look. Born January 16th, 2001, they started the playing in the T-Ball division in 2005 and placed on different teams. Consequently, after spending most of their time playing in a dirt pile next to the field, and not on the diamond; And not to mention their dirty uniforms their Mom decided to take them out of baseball. After one year, Mom allowed them to return to the game, and where they were placed in the coach pitch division, excited about their new team, the Sand Flies, they started to love the game and went on to the win the division championship. Twins D’Shawn and D’Vaughn became teammates in coach pitch and started looking out for each other as their game progress, (they had each other back all the time.) Additionally, they had each other as teammates from coach pitch right up to 13-15 division. Winning championships from 2009 coach pitch division with the Sand flies, 2012 11-12 division with the Conchs and the 13-14 division all three of their seasons with the Raccoons, 2014, 2015, and 2016, They won five in total. D’Shawn & D’Vaughn with former Sandflies Teammate Keithron Moss Center. On the other hand, with the baseball talent on the Islands growing, MaxD Baseball Academy was started to enhance the game. 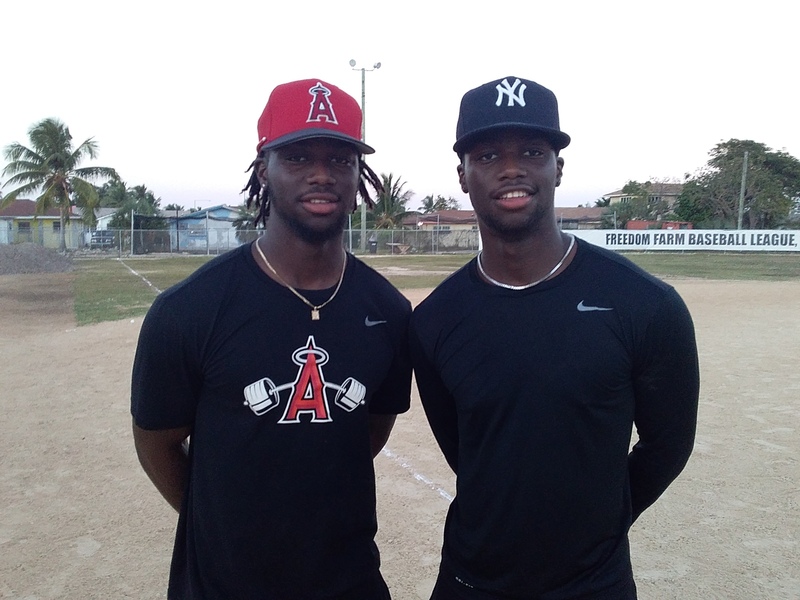 As a result of the opening of MaxD, D’Shawn, and D’Vaughn enrolled at the Baseball Academy, which saw more and more baseball scouts coming to the Island looking for talent. Which gave more opportunity to play minor league baseball a reality. After, winning the MVP award in 2016 at the Andre Rodgers National Baseball Championships. Twin D’Shawn and D’Vaughn put on a show in the 13-15 division championships. That saw Freedom Farm League sweeping all five divisions at the Nationals. Together with, Trent Deveaux and Kristian Robinson, D’Shawn Knowles selected by the Angels on international baseball signing day. Also, Keithron Moss was signed by the Rangers on December,12th 2017; And By the same token, as D’Shawn began his minor league career in June 2018, D’Vaughn signed by the Yankees on the July international players signing day. Furthermore, seventeen years old D’Shawn Knowles started turning heads early, from his first game with a pinch-hit single. As a matter of fact, He got six hits in the AZL Angels first four games. With this in mind, the Angels made the seventeen years D’Shawn Knowles their #30 top prospect. With 34 hits in 113 at-bats for a .301 average with the AZL Angels, D’Shawn Knowles was moved to the Pioneer League Orem Owlz. Where finished his first season on a hot streak, D’Shawn move to the Owlz saw him with 35 hits in 109 at-bats for a .321 average and four home runs, finishing the season with 69 hits for 222 at-bats for .311 batting average with five home runs, that made him the Angles #24 Top Prospect. D’Vaughn & D’Shawn at a Freedom Farm Baseball League game. At last, D’Shawn is finally home for some relaxation with family and friends along with twin brother D’Vaughn Knowles. After all the training camps, spring training, league play, instructional league, with more training camp is home at last, and it feels good. At the Anfernee Seymour/ Natasha Watley Baseball/Softball Camp. Identical twins Rashawn and Raivon Pinder meet Angels/Yankees D’Shawn and D’Vaughn Knowles at Freedom Farm.